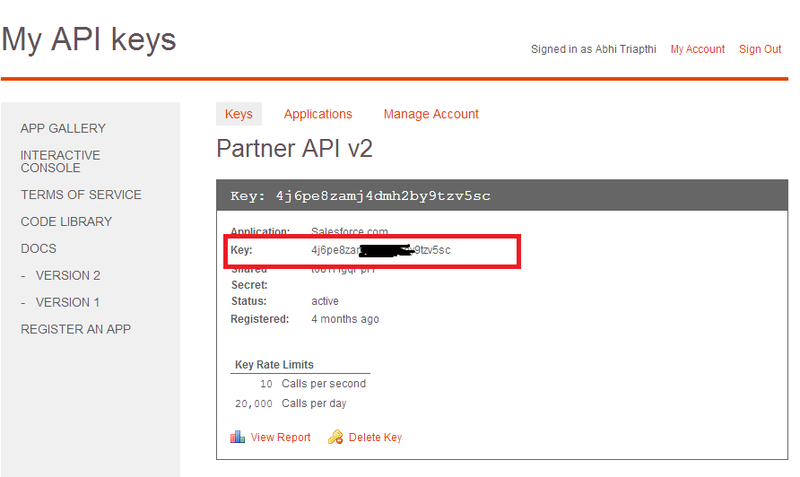 Recently from the client side got a requirement of getting Twiitter Account rating in Salesforce using Klout. Here what we are doing is just creating a visualforce page which is having custom fields of Account on the click of a button on detail page, our visualforce page will open, where user will get its Twitter Account rating. Write your twitter Screen Name and click on the button "Get Rating"
Now the question rises how to do this thing? 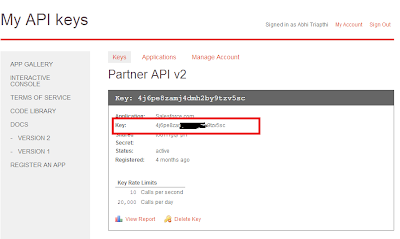 So first of all, create an Account in Klout(Link provided above) then on the dashboard Click on "REGISTER AN APP", fill all the formalities and then you'll find this, marked in red is the key which we'll use to get Twitter score. /**     Description    :    Ths class will Integrate Salesforce with Klout. Now get your Twitter Rating in your salesforce. It found very easy and smart way of codding !